Cricket - Lightcliffe v New Farnley. Lightcliffe batsman Suliman Khan. The margin was seven wickets in all three Bradford League games involving Calderdale clubs yesterday with Lightcliffe losing to Premier Division leaders New Farnley but Brighouse and Northowram Fields notching wins in Championship Two. Lightcliffe were unable to post a competitive total at Wakefield Road, being dismissed for 122 with Suleman Khan’s 37 the top contribution. The home batsmen struggled to cope with the spin of Luke Jarvis (5-22) while Dave McCallum (3-43) also gave them problems. A couple of wickets from Yassar Abbas and one from Khan left New Farnley 39-3 but that was the limit of the home attack’s success as wicketkeeper Steve Bullen (48no) and skipper Lee Goddard (41no) completed victory in the 31st over. Brighouse were successful on the lengthy trip to Wakefield St Michael’s and Northowram Fields at home to Spen Victoria. Brighouse bounced back from a setback against Birstall with a seven-wicket win over the second-placed club. The success puts them in the promotion picture approaching the half-way point of the season. Opening bowlers Abid Awain and Quadratullah Azizi took seven wickets between them as Saints were dismissed for 211 with two deliveries of their 50 overs unused. Brighouse were 30-2 in reply before a decisive stand of 170 between overseas player Deron Greaves and Sohail Hussain. Greaves made 129 not out off 89 balls and Hussain provided excellent support with 58 off 62 before departing with victory in sight. At Westercroft Lane, player-coach Ajantha Weerappuli made a successful return from injury for Northowram. With three regulars missing, the Sri Lankan-born player was hurried back into action after a broken finger, and hit 93 not out from 80 balls as Spen Victoria’s 234-9 was comfortably overhauled. “AJ” shared stands of 95 for the second wicket with youngster Jacob Slater (40) and then 125 with Dru Patel, who lashed 80 off 50 balls, as the Rams climbed to eighth. Earlier, Jason Smith had returned the best figures (3-60) with Ollie Davison (63) showing the way for Spen. A century from Jamie Summerscales at Skelmanthorpe yesterday helped strengthen Barkisland’s bid for a return to the Huddersfield League’s top flight. Summerscales hit 116 off 135 balls, with Luke Bridges (46) the other main contributor in a Barkisland total of 253-7 and the hosts made 194 in reply. Also in the Championship, Rastrick lost their top-four clash at Clayton West by 39 runs in spite of a typically strong contribution from pro Asif Afridi. The Pakistani took five for 36 off his 15 over allowance but opener David Swann (56) spearheaded a solid batting effort from the home side, who posted 238-7. Rastrick were soon 4-2 in reply but Afridi hit 62 off 51 balls to revive their hopes. Skipper Jacob Waterson made 60 off 69 but the loss of Wasim Javed for 27 triggered the loss of the Round Hill men’s last four wickets for the addition of only eight runs. They were all out for 199. Mid-table Elland were easy 103 home winners over next-to-bottom Lepton Highlanders. Their top three batsmen all scored heavily as they piled up 299-4 at Hullen Edge with Paul Winrow making 95 and Kiwis Alec Hodgson and Ciaran O’Malley 93 not out and 58 respectively. Jack Hendy (4-38) inflicted early damage in Lepton’s reply but No 5 Qaiser Rashid helped the visitors to 196. Walsden continued their bid to win the Lancashire League title at the first attempt with a an easy seven-wicket home win over East Lancs. Home grown opening bowler Jamie Shackleton came up trumps again with 6-34 and Umesh Karunaratne took 2-1 off his two overs as the visitors folded from 51-1 to 76 all out. 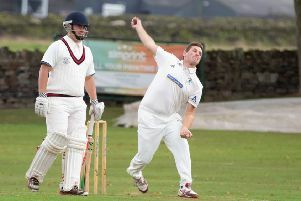 James Rawlinson’s 38 not out completed an 11th straight win for the reigning Pennine League champions in the 20th over. Todmorden lost by 36 runs at Church and face a battle to finish in the top half of the table ahead of next season’s split into two divisions. Matt Collins dismissed Sam Holt with the score on one and it was slow going for the home side in the first 25 overs. However, Tod had to wait until the total had reached 156 before claiming their next success, Josh Scully departing for 51. Home pro Johnny Riekert went on to complete a maiden century, finishing on 105, but it was skipper Levi Wolfenden’s 58 not out off 33 balls which really hurt Tod, who had a depleted bowling attack. Church finished on 235-2 with 57 coming off the last four overs. Tod had Ryan Canning, like Riekert a South African, deputising for broken finger victim Chris Schofield as pro. He made 62 and there were other decent contributions from skipper Andrew Sutcliffe (43), Ben Pearson (31) and Ben Sutcliffe (22) but Josh Dentith’s 5-40 gave Church the edge after the visitors had been 143-2.